After an extremely competitive audition process, the 2019-2020 Golduster Dance Team has been announced. The team welcomes 5 new members this year. Malaya Atisso is a high school senior at Harrison High School from West Lafayette, Indiana, and majoring in Development and Human Science. Jadin Benge is a Purdue freshman from Carmel, Indiana, and will be majoring in Biology with a concentration on Nursing. She attended Southport High School. Payton Fine is a high school senior at McCutcheon High School from Lafayette, Indiana, and will be majoring in Finance. Peyton James is a high school senior at IC Catholic Prep from Elmhurst, Illinois, and will be majoring in Anthropology. Julia Vogele is a high school senior at Archbishop McNicholas High School from Loveland, Ohio, and will be majoring in Data Science. 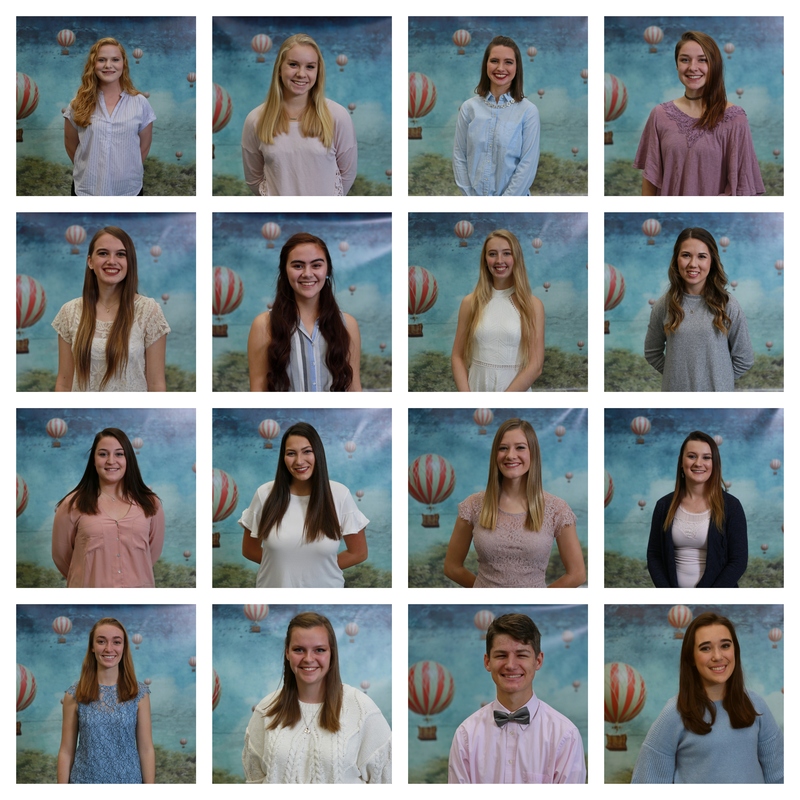 Returning members include Brittany Gallarneau, Kate Giglio, Ally Kiger, Rylee Madden, Emma McAlister, Hannah Ortman, Brittany Rogers, Sarah Sipe, Sophia Strain, Dayna Tanner, and Lauren Waddington. WEST LAFAYETTE, Ind. – Kaitlyn Schleis of Oshkosh, Wisconsin, will serve for a second year as the 30th Purdue Golden Girl, continuing a tradition started in 1954 by Director of Bands Emeritus, Dr. Al G. Wright. On Saturday, March 2, her audition earned her one of the most iconic positions on Purdue’s campus. Schleis is a junior in Speech, Language and Hearing Sciences, and she has held the positions of Silver Twin, Girl-in-Black, and Golden Girl during her time at Purdue. Current freshman, Amanda Coy of Saline, Michigan, will return as the Girl-in-Black. Coy began twirling in 2003 and twirled on a competitive team for 13 years. Coy is studying Political and Health Sciences. For the second consecutive year, the Purdue “All-American” Marching Band will feature Miss Boilerette. Alicia Dennie, from Culver, Indiana, will return as Miss Boilerette for the upcoming season. Dennie is a sophomore majoring in Pre-Dental, and previously held the position of Silver Twin as a freshman. Miss Boilerette was originally part of the Purdue Twirling program during the 2010-2011 season. Current freshman, Alexis Piskulic of Arnold, Missouri, and sophomore, Brooke Wyatt of LaFontaine, Indiana, will return next season as the iconic Silver Twins. Wyatt, who is majoring in Hospitality and Tourism Management and minoring in Event and Meeting Management, is returning to her position as a Silver Twin for her third year. Piskulic, studying Political Science and Sociology with a minor in American Sign Language, will perform as one of the Silver Twins for her second season. In addition, eight students were offered spots on the All-American Twirling Team as part of the Purdue Twirling program. They include returning twirlers, juniors Mackenzie Joefreda and Emma Schafer, sophomore Marin Parker, current freshmen Ashley Brazeau and Leah DePasquale, and incoming freshmen Marissa Grigora, Caroline Hawkins, and Alexa Tamburlin. All twirlers and band members are required to audition for positions annually, and candidates must be admitted to Purdue University in order to qualify for auditions. We are thrilled to welcome our new team to Purdue this fall. They will make their debut performance on Saturday, August 17, when the 134th edition of the Purdue “All-American” Marching Band takes the field for their End-Of-Camp Performance. Following a demanding audition process, the Purdue “All-American” Marching Band is pleased to announce that Lucy Bays and Brendan Schultz will serve as the Drum Majors for the 2019-20 season. The two will lead the band to carry on its tradition of excellence through athletic events, travel opportunities, and thrilling performances. As the AAMB celebrates this appointment, the Band also wishes their outgoing Drum Major, Zach Sutton, all the best as he begins a very successful career. The first public performance for the new Drum Majors is on Saturday, August 17, when the 134th edition of the Purdue “All-American” Marching Band takes the field for their End-Of-Camp Performance. Due to projected inclement weather, the Purdue Jazz Festival events originally scheduled for Saturday, January 19th have been cancelled. These events will not be rescheduled. However, jazz fans may still attend a FREE concert at 12:00pm on Saturday at Loeb Playhouse featuring the Purdue Jazz Band, along with guest artists Brian Lynch, Roxy Coss, and Jarrard Harris. The Friday night 8pm performance by Stefon Harris + Blackout at Loeb Playhouse will also continue as regularly scheduled. Tickets are required for the Friday night concert and can be purchased through Purdue Convocations: www.purdue.edu/convocations/event/stefon-harris-and-blackout/. Save the Date for next year, January 16-18, 2020 as Purdue Bands & Orchestras celebrates the 30th Annual Purdue Jazz Festival in Stewart Center, Pao Hall, and the Purdue Memorial Union. The Purdue Winter Guard is pleased to announce their 2019 production, “Up, Up, and Away!” They will be performing to the music of Ron Nelson’s “Rocky Point Holiday.” The Purdue Winter Guard season will begin with a Preview Night at Lambert Fieldhouse on February 13th, where members will display guard techniques, warm-ups, and their production of “Up, Up, and Away.” Season performances will include appearances at WGI Indianapolis, Chicago, and Cincinnati Regionals, as well as a Send-Off performance in April. We hope you will join us in celebrating 2019 The Purdue Winter Guard! Christina Davidson, Erin Hendrix, Roxanne Huff, Allie Megl, Maddie Moore, Lindsay Muller, Sarah Myers, Maraya Neff, Sarah Niehaus, Lauren Richardson, Breanna Roti, Nina Scheel, Kaitlyn Scholl, Aidan Selvia, Caitlin Sever, Colbye Skeens, Maxwell Smith, Hailey Stoddard, Sarah VanBuskirk, Isabel Weatherhead, Katelyn Witcraft, and Teresa Woerner. The 2018 Lafayette Christmas Parade, originally scheduled for Saturday, December 1 at 5:30pm, has been cancelled due to projected inclement weather. For more information, click the link below to read the story on WLFI. The Purdue “All-American” Marching Band’s next public performance will be at this season’s football bowl game (location and date TBA). Follow the Purdue “All-American” Marching Band on Facebook for updates and information on upcoming performances. Purdue Bands & Orchestras has announced the finalized dates for two highly anticipated upcoming Alumni Events. In celebration of the Purdue “All-American” Marching Band’s 100th Anniversary as the host band for the Indianapolis 500, alumni are invited to participate in the Purdue University Indy 500 Alumni Band. Participating alumni will perform in the 2019 IPL 500 Festival Parade on Saturday, May 25 and in the 2019 Indianapolis 500 Parade of Bands on Sunday, May 26 (Race Day). The Festival Parade will take place in downtown Indianapolis and the Parade of Bands on Race Day will take place on the track of the Indianapolis Motor Speedway. Alumni will have rehearsal on Friday night of May 24 at Butler University, where they will also be housed for both Friday and Saturday nights. Cost for the Indy 500 Alumni Band experience will cover housing for two nights at Butler University, four meals throughout the weekend, ground transportation to the parade downtown and the IMS on Race Day, and a ticket to the Indy 500 race. Further details including cost, itinerary, and registration will be announced in the near future. The Purdue Bands & Orchestras Alumni-only Hawaii trip is now scheduled for June 2020. The Hawaii trip is open to all of our Purdue Bands & Orchestras alumni and will include opportunities for sightseeing, additional optional excursions, and unique performance experiences. The trip will take place from June 6 – 14, 2020. Music Travel Consultants, an organization that has planned many national and international trips for all of our ensembles, will be organizing the Hawaii Trip. Registration through Music Travel will go live on January 1, 2019 for the June 2020 event. More information, including the itinerary, will be released by the time registration goes live in January. This longer registration period will allow alumni nearly 18 months to plan and prepare for this exciting trip. Alumni are encouraged to sign-up for the department email list here and follow Purdue Bands & Orchestras on Facebook for the most up-to-date information. Purdue Band Day is an annual partnership between the Purdue “All-American” Marching Band and high schools from around the Midwest. During the day, high school band students have the opportunity to meet, rehearse, and perform with members of the Purdue “All-American” Marching Band and get a feel for what a Big Ten college marching band is like. This year, over 20 high schools from all across the state will bring band students to participate, making a “mass band” of around 1700 students. Purdue Band Day 2018 will feature guest conductor, Jim Butz. Jim is the retired Director of Bands and Music Department Chair at Ben Davis High School where his bands won 6 state championships and his jazz band won numerous awards including an invitational performance at the Indy Jazz Fest. The day will begin with a mass band rehearsal at the Hull Practice Field where high school bands will join Purdue in their halftime show preparation. Following the rehearsal, students can eat lunch and watch the Purdue “All-American” Marching Band at Slayter Center, a 20,000-person outdoor amphitheater on Purdue’s campus, where they perform in an exciting Purdue pre-game tradition, “Thrill on the Hill”. The visiting high school bands will have special seating in Ross-Ade Stadium during the game. The Halftime show will feature the Band Day performance with the Purdue and high school bands on the field together. Purdue Bands & Orchestras welcomes Scott Pazera as the newest member of the department. Pazera will serve as a Visiting Instructor for the Purdue jazz bands alongside Dr. Mo Trout. Scott Pazera has been teaching and performing on guitar and bass for over 30 years and is a motivated instructor, small business owner, and spirited performer. Scott has been performing publicly with his own jazz groups and often works as a sideman to some of the top performers in the Midwest. He has performed and/or recorded with artists such as Rich Little, Veruca Salt, Ce Ce Peniston, Med Flory (Supersax), Fareed Haque, Henry Johnson, Charlie Hunter, Byron Stripling, Rachel Yamagata and many others. He is currently the jazz band director at Wabash College in Crawfordsville, IN. Scott is also an MSMT graduate of IUPUI as well as a BS and MPA graduate of Indiana University. Recently he directed the Purdue University Jazz Band and other ensembles while Dr. Marion Trout was on sabbatical. He also assists with the Lafayette Jefferson High School Jazz ensembles and has worked as a clinician for the Indy Jazz Fest as well as many other festivals.